Several hundred participants gathered at the Cathedral Basilica of SS. 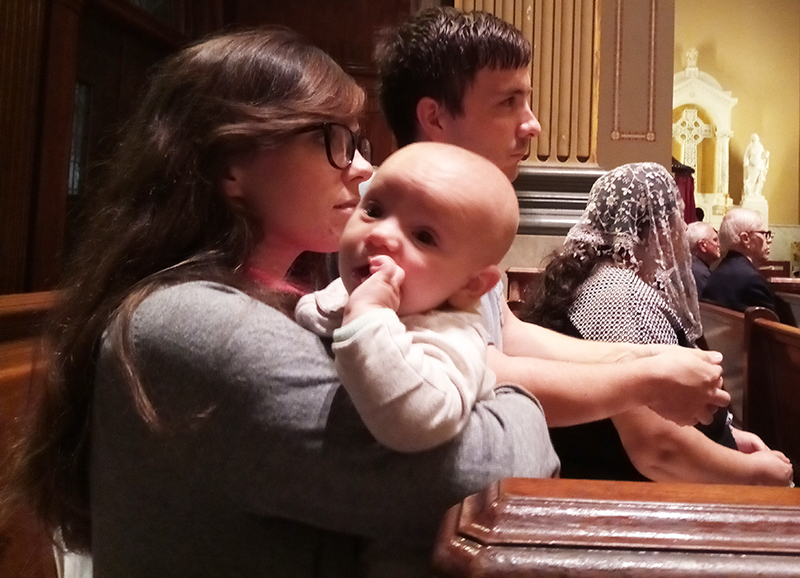 Peter and Paul on Sept. 14 for a prayer vigil organized by the Archdiocese of Philadelphia in response to the ongoing clerical sexual abuse crisis. The seven-hour event, entitled “Have Mercy on Us, O Lord,” centered on both communal and private prayer during an evening of eucharistic adoration. Father Dennis Gill, director of the archdiocesan Office for Divine Worship, presided over the vigil, which began at 5 p.m. with solemn exposition of the Blessed Sacrament and ended with benediction at midnight. Attendance averaged between 100 and 125 at the beginning and end of the vigil, swelling to approximately 400 from 7 to 9 p.m.
Each hour of the gathering began with a hymn, followed by a Gospel reading and the prayer to St. Michael, an invocation for divine protection originally composed by Pope Leo XIII. The litany of the saints was also recited, along with prayers for deliverance from sin and evil. Most of the evening’s Scripture readings focused on Christ’s passion and death; Psalm 51, one of the church’s most widely used penitential psalms, was sung during the vigil’s third hour. The sacrament of reconciliation was available throughout the service, which was designed as “a prayer vigil of reparation and petition,” according to Father Gill. In particular, prayers were offered for “all sins of sexual abuse and sexual immorality, especially by members of the Catholic clergy,” as well as “all sins of cowardice, deception, sloth and self-protection, especially among those in positions of authority in the church,” according to the official announcement for the vigil. Petitions sought healing for sexual abuse victims, and for a purification and revitalization of both individual believers and the church as a whole. Four counselors from the archdiocese’s Office for Child and Youth Protection (OCYP) were on hand from 7 to 8 p.m., along with two additional counselors from the Keystone Crisis Intervention Team, part of the Bucks County based Network of Victim Assistance. Attendees included a mix of laity, clergy and religious from throughout the archdiocese. More than 50 members of the Sisters, Servants of the Immaculate Heart of Mary congregation attended, having been encouraged by their leadership team to make a holy hour at the gathering. “We wanted to show our solidarity and to participate in prayer for all who are hurting,” said Sister Mary Ellen Tennity, I.H.M., general superior of the congregation. She added the order had also organized a separate holy hour earlier that afternoon to accommodate senior members who could not travel to the cathedral. Terence Sweeney and Jessica Ferro, both of St. Francis de Sales Parish in West Philadelphia, said the vigil offered a constructive outlet for their grief and outrage. “It gives us the opportunity to come together and to actually bring things to the Lord instead of just dwelling on them,” said Ferro, who serves as the program and communications coordinator for the Collegium Institute, a Catholic intellectual foundation based at the University of Pennsylvania. Sweeney added the gathering should serve as a model for similar services throughout the archdiocese. Noting that he felt “a mixture of anger and sadness” in response to the abuse scandals, Father Higgins said that the prayer vigil was just the start of the longer healing process. Father Higgins added that despite the failings of fellow clergy, he was still “proud to be a priest.” He credited his clerical support group with helping him and his fellow priests meet the challenges of ministering during the ongoing crisis. Several seminarians in attendance expressed their support for all those affected by clerical abuse. “I was inspired by seeing so many people, whose own crosses are heavy enough, pick up the cross of those who have fallen, and also accompany victims in the midst of inexplicable pain,” said Andrew Auletta, who is now in formation at St. Charles Borromeo Seminary in Wynnewood. The vigil drew one protestor, who stood facing the cathedral’s front doors with a poster of a young man’s face. The gentleman declined the opportunity to speak with CatholicPhilly.com. Phong T. Le, a seminarian who stayed until the conclusion of the vigil, said that the evening had imbued him with a sense of the Lord’s presence. “I have a feeling of hope that God will purify our church,” said Le. Father Gill stressed that the vigil was ultimately an expression of confidence in Christ. For more information on the Archdiocese of Philadelphia’s response to clerical sexual abuse, including a statement from Archbishop Charles J. Chaput, visit the website A Pledge to Protect. Also see information on the Archdiocese of Philadelphia’s Office of Child and Youth Protection, including Victim Assistance Services, the staff of which may be contacted at 215-587-3880 or 888-800-8780, or email philavac@archphila.org. To report abuse by a clergyman, staff member, or volunteer of the Philadelphia Archdiocese, call the Office of Investigations at 888-930-9010 and your local law enforcement agency. 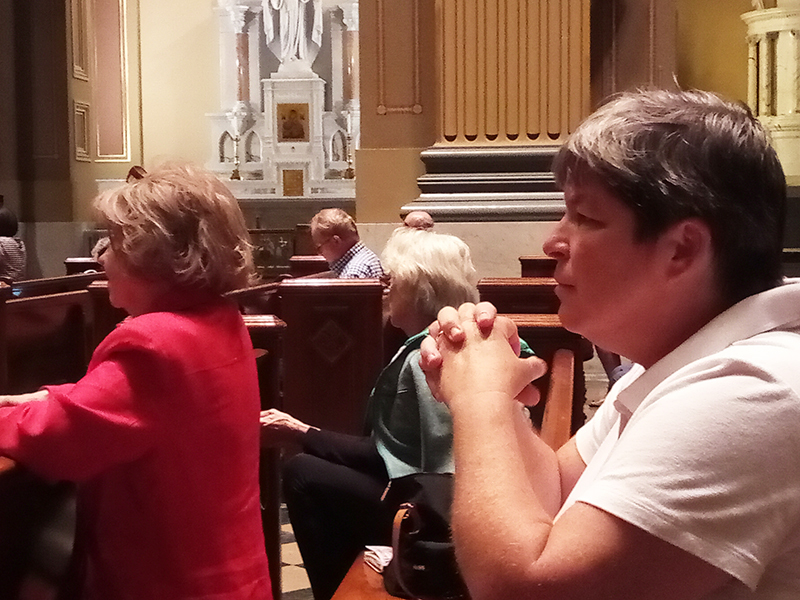 Thank you for providing an inspiring witness of the Prayer Vigil at the Cathedral Bascilla of St.Peter and Paul. Jesus is the healer and we all need to experience His Presence in this time of crisis. Yes, this purification, with changes in church policies, can lead to a new era of healing. Each day I pray for the Holy Father, all cardinals, bishops, priests and seminarians, and all victims Also, I pray for those who sinned and betrayed Jesus and His people. All parishes need to hold Holy Hours of Reparation. Many of us cannot travel at night to the Cathedral. COME HOLY SPIRIT AND RENEW THE FACE OF THE EARTH! Prayer is fine, but prayers have been said for two thousand years. And look at we are ,words and actions have to match. We need to release this abusers to law enforcement and have them prosecuted. They should be in jail! What message is the church giving to the victims? What they did is a crime. Criminals to go jail.